the gentle arc of the Achilles tendon. Achilles Tendon problems have plagued me since college. Stretching, strengthening and gradually increasing training distances (especially hills) has helped prevent or minimize injuries. I've done several marathons, half-marathons and a lot of mountaineering in the Sierra without problems. 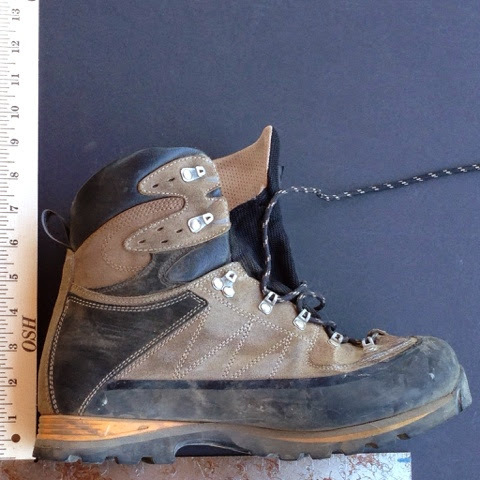 But at the beginning of Sierra backpacking season in 2013, my old Columbia boots finally fell apart after about a decade of hard use. Columbia no longer makes that boot style. And I found their new styles not rugged or supportive enough for a 50-pound pack in the mountains. My search since then took me through five pairs of other boots. 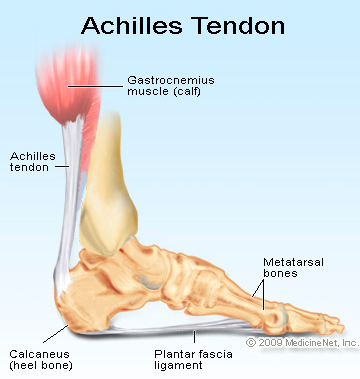 The first four produced Achilles tendon pain and swelling. Images of numbers 3-5, are discussed below. No amount of training helped me with the first four pairs of new boots. And the pain vanished when I didn't wear the books. Long distance runs and extreme slope trail running (with pack) were all fine as long as I wore my running shoes. 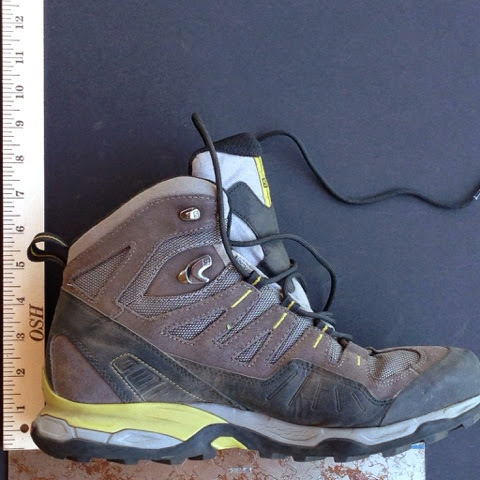 With help from the web and several podiatrists, boot number five solved the problem. Take a look at the illustration of the foot, above. A proper fit in a boot would be for the high top to follow the gradual curve at the back, parallelling the Achilles tendon. Gradual curve, not extreme like the first two boots, below. Asolo boots. Extreme angle pressed into Achilles tendon. Solomon boots. Lower cut, but still too much of an angle in. Also pressed on Achilles tendon. Vasque boots. Gentle angle. Did not press on Achilles tendon. The Vasques performed fantastically on their first outing this year, to the California Matterhorn in the Eastern Sierras. I'm currently repairing the scrape and cut damage to them done by clambering over a vicious sharp granite boulder field. But no complaints about the boots. Note: all photos were taken from the same angle and distance. A square was used to position all the boots the same. I encourage all my patients to stay active with regular exercise. Whether you prefer strength training at the gym, outdoor fitness activities or team sports, regular exercise is one surefire way to boost your health and promote longevity. Just because you aren't a professional athlete, however, doesn't mean you can't be sidelined unexpectedly with an injury.For more information Visit Shoes For Achilles Tendonitis. The Vasques performed phenomenally on their first excursion this year, to the California Matterhorn in the Eastern Sierras. I'm at present repairing the scratch and slice harm to them done by climbing over an awful sharp rock stone field. Be that as it may, no protests about the boots. I read this with interest as I've suffered with achilles tendonitis since wearing a pair of Timberland boots just to walk my dog in our local country party (about 18 months now) and it started because of the back of the ankle digging in and pressing on the tendon - have you found that with a properly fitting boot with a more gradual angle, that even when it starts to crease with wear, that it does not cause the pressing on the tendon - I also appreciate that the interior of the boot needs to properly support the foot through the arch etc, but predominantly my fear of buying walking boots is the achilles issue. 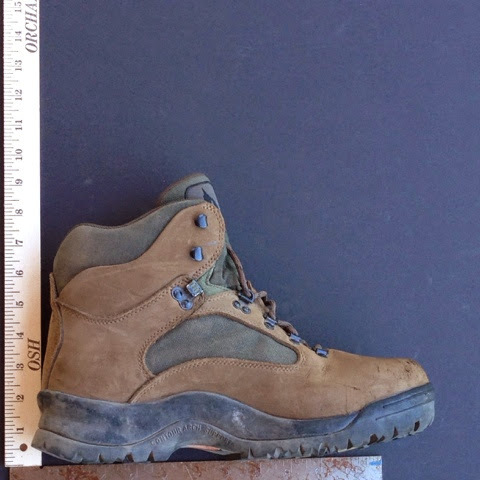 I live in the Uk and would like to complete the three peaks challenge, but to do so I have to wear boots as opposed to walking trainers (which don't cause me issues).